Will Spider-Man: Homecoming Take Peter Parker Out of New York? Earlier this week, we showed you the first look at the official costume in Spider-Man: Homecoming, with Tom Holland spotted near what appeared to be a construction site. 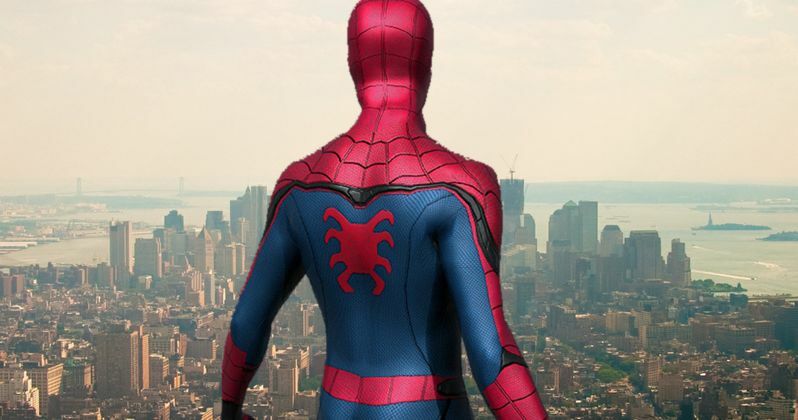 As is the case with most set photos, we don't get too much context of the scene we're looking at, but today we have a report that claims Tom Holland's Peter Parker may be leaving New York City in this highly-anticipated movie. If that wasn't enough, the growing cast has just added three more actors. A report from Looper, which included the photos from earlier this week, revealed that Tom Holland was shooting two scenes that day, one being a bus scene where kids from his high school are taking a field trip to Washington D.C. The second scene, which is where the photos were taken, follows Spidey running alongside a cement truck and jumping on it. The scenes did feature Tom Holland himself, and not a stunt double in the Spider-Man suit. This scene was set in the nation's capitol, since there were a number of trucks seen with Washington D.C. plates, although nothing else is known about what happens in this action sequence. In related news, Deadline reports that the cast keeps growing and growing, with a trio of actresses coming aboard. Garcelle Beauvais, Tiffany Espensen and Tyne Daly have all signed on to star. No details were given for any of their characters at this time, and it isn't known if they've already started shooting in Atlanta yet. Regardless of who they're playing, they all join an increasingly diverse cast. Tom Holland leads a cast that includes Marisa Tomei as Aunt May, Robert Downey Jr. returning as Tony Stark/Iron Man, Michael Keaton as the villain, rumored to be Vulture, Logan Marshall-Green is rumored to play another villain, The Tinkerer, and Laura Harrier and Michael Barbieri are in unknown roles. The cast is rounded out by Donald Glover, Kenneth Choi, Hannibal Buress, Bokeem Wodbine, Michael Mando and Abraham Attah. There have been rumors that Michael Mando is playing the villain Carnage, while Abaraham Attah is rumored to play Miles Morales. Jon Watts (Cop Car is directing Spider-Man: Homecoming from a script by John Francis Daley and Jonathan M. Goldstein (Vacation. Kevin Feige and Amy Pascal are producing, with Marvel and Sony setting a July 7, 2017 release date. Garcelle Beauvais most recently starred in Barbershop: The Next Cut, while Tiffany Espensen recently starred in Earth to Echo. Tyne Daly, best known for Cagney & Lacey and Judging Amy, most recently appeared in Hello, My Name Is Doris.